The first thing a dentist typically does during a routine exam is to give the lips, teeth, and mouth a visual inspection. This is done to identify any prominent areas of concern that may exist, such as new cavities, teeth chips or fractures, or tissue discolorations. The dentist will also check your tongue, face, head, neck, and throat for redness or swelling. This is done to catch warning signs of serious conditions such as oral cancer. Checking the condition of the patient’s gums is another common step. One of the earliest signs of gum disease is pockets of air between the teeth and gums. Your dentist will probably have you open and close your mouth several times. This is done to check proper jaw function and alignment. He or she may use a stethoscope to listen for clicking sounds in the jaw, a common symptom of TMJ. Once the oral exam is complete, either your dentist or a trained assistant will perform a deep cleaning in Natick designed to remove tartar and stains from your teeth. This is a gentle, comfortable process that’s essential for your teeth’s long-term health. The last two steps in the tooth cleaning process are to polish and floss the teeth. Afterwards, your mouth will feel clean and refreshed. 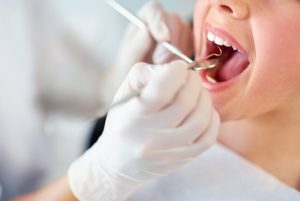 Your dentist will finish up the exam by discussing any problems he or she may have noticed and by offering tips for keeping your teeth and gums in great shape. You’ll have a chance to ask any questions you may have. The office manager will probably review your coverage information and update it if necessary. You’ll leave the clinic feeling good for having taken an important step in keeping yourself healthy. Brushing at least twice a day. After every meal is better. Use a soft bristle toothbrush and a fluoridated toothpaste with the ADA seal of acceptance on the packaging. Flossing every day. You’ll find floss strings on the market in a variety of widths and in both waxed and un-waxed versions. Ask your dentist for tips on effective flossing. Eating a sensible diet. It’s important to limit consumption of sweets, simple starches, and alcohol. Avoiding tobacco products. This includes taping devices. All forms of tobacco can have devastating effects on your health. Your dentist can recommend new medications to help you to stay smoke-free. Regular dental visits are an important part of living a healthy lifestyle. The time and effort you put forth will pay for themselves with healthy teeth and gums for a lifetime. Dr. Laura Immanuel has been practicing dentistry for more than 20 years, 18 of them in the greater Boston area. Dr. Immanuel earned her DMD degree from Tufts University School of Dentistry. You can reach her office online or by calling (508) 545-1126.